It has always been trivially easy to label Grim Fandango a timeless classic, its place secure in pantheon of nineties adventure games. But it has not been so trivial to play, and validate such a claim, until now that is. 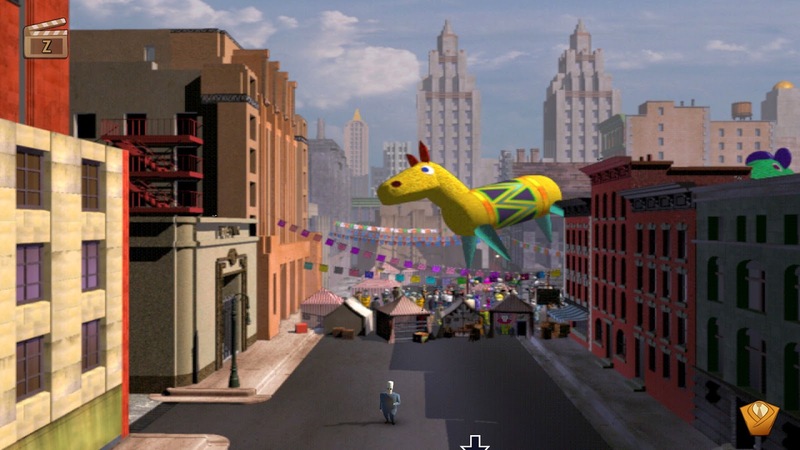 With the release of Grim Fandango Remastered we are pressed with the difficult question; just how timeless is it? It’s weird. In case you didn’t know, or like me, had forgotten, Grim Fandango is little off base. The scene opens with Manuel Calavera (Manny) stepping into his office, robbed in black and armed with an extremely practical, retractable scythe, his client waits, smoking solemnly. The tone is dark, foreboding and suitably grim. Then Manny slaps a selection of travel brochures on the desk and begins talking shop, salesmen shop, and the dark mood is sent tumbling out of the office window in the best possible way. 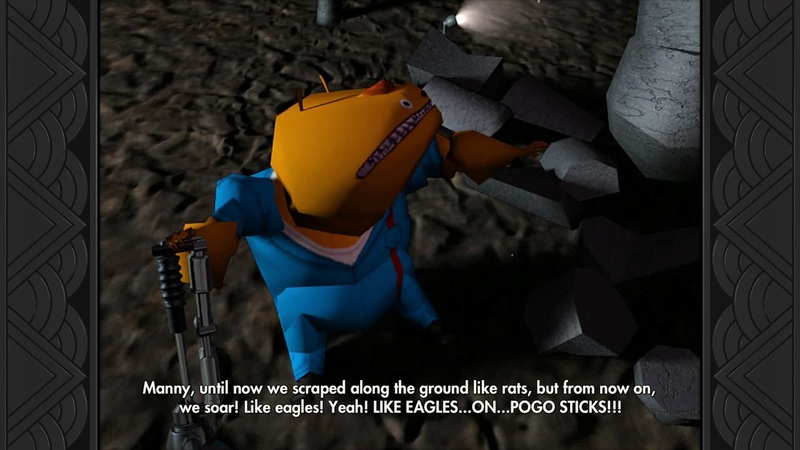 The game is packed with memorable characters, made unique by their excellent dialog – you will never truly forget Glottis. 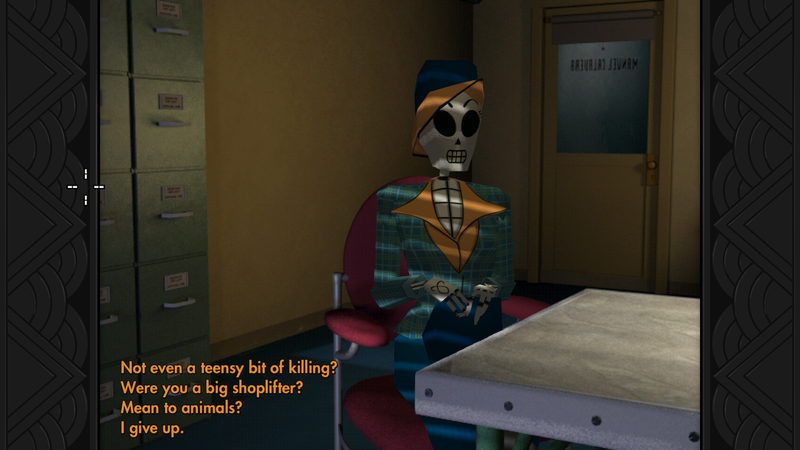 Grim Fandango sees an Aztec aesthetic, and cultural themes, merge with the cinematic trappings of film noir. The story takes literally unpredictable twists and turns, yet somehow remains coherent. So no, the story of Grim Fandango has not been lessened by age. The gameplay of Grim Fandango, while not exciting or dynamic in the least, holds up fine for the most part. As a traditional adventure game, you click on the objects in the environment to solve puzzles. The puzzles will send you hunting across several screens in an environment, having conversations, collecting items, and so on. The solutions to these puzzles are rarely obvious, certain stages may be apparent, for example; a man drops a cigarette box and a key falls out. You clearly need to acquire the key, but how you get to that point is a multistage guessing game, what the key unlocks isn’t clear either. Having played the game years ago, as a child, I can recall the solutions to certain puzzles, others though I have no recollection of. 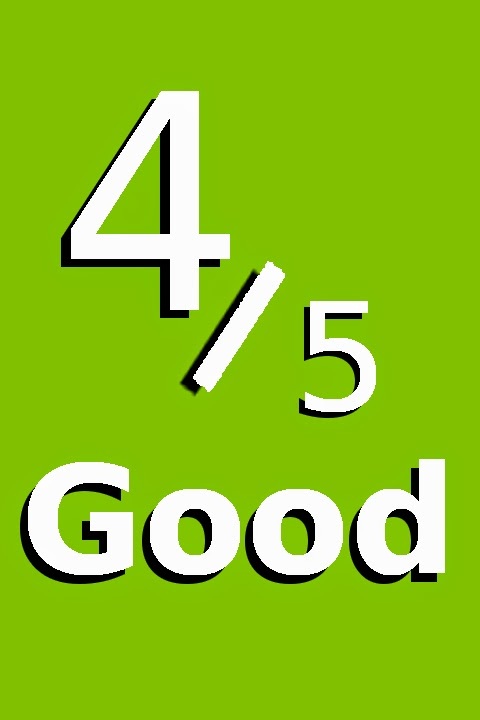 The puzzles often reward patience rather than logic thought; if you click on everything, with everything, or create the an elaborate fantasy solution in your mind and you will probably get by fine. That said, Grim Fandango is not a punishing game, there is no deterrent for trying every item on every character and object on screen, beyond perhaps having to retread a couple of steps each time. The game does not look drastically different than the original, character models were redrawn and look sharper, and new lighting has been added, but the original animations are used, and the backgrounds look a little grimy. As someone who played it back in the day, it is a powerful nostalgic feeling to recognise the original environments and see snippets of old grainy animation. Of course, to a player that hasn’t previously played it, or have any knowledge of games of that era, I could easily envisage it appearing sloppy at least. 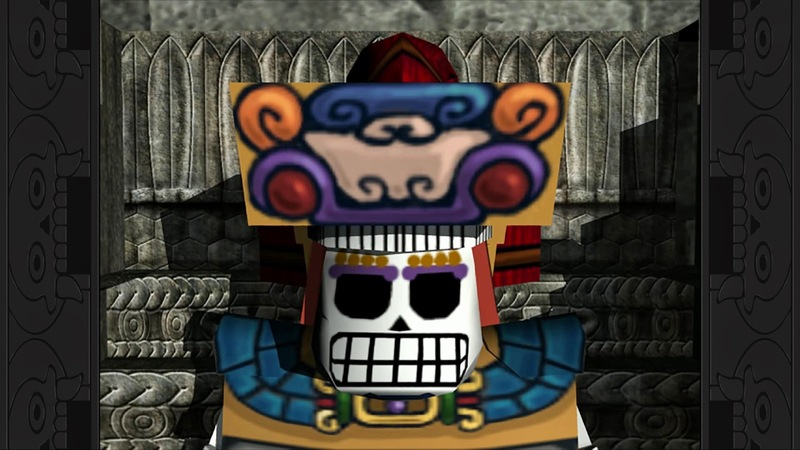 Fortunately, the art remains stellar, the cartoonish Aztec crossed with the moody film noir, ensures Grim Fandango looks wholly unique. By sticking to largely original assets, I still felt like I was playing an old game, which in this case, I believe to be a positive thing. Take Halo: Combat Evolved Anniversary for example, that game added a new graphics engine to the mix; the old and new graphics could be toggled quietly smoothly. Upon entering a new area I would recognise something in the new engine, a specific building or rock formation and switch back to the old look and become instantly deflated. Because the thing I remembered so fondly looks like garbage now. Grim Fandango avoids this scenario but in turn doesn’t benefit from the startling lick of paint that many remasterings do. Instead, I recognise something and it looks how I remember it, I stop thinking how old the game is and remark how well it still looks. Seventeen years (give or take) has done nothing to diminish excellent direction of Grim Fandango‘s bizarre story and quirky characters. The cutscenes exude a film-like quality in their presentation, remaining superior to those of many story-driven games of today. A similarly impressive level of attention also extends to the player-controlled portions of the game, specifically with regards to the camera perspective in each environment; what is in the foreground, the background, how the characters and sounds scale with distance. There are more subtle points too; for example, Manny doesn’t store items in an out-of-world menu, he pulls them from his suit pocket, regardless of size or shape, offering some witty commentary as he does so. The environments you move through are generally constructed in a way that makes determining your path and exits quite obvious, even when some architectures are particularly elaborate, snaking around themselves to fit into a single screen. The presentation is supported by outstanding voice acting; Glottis and Manny are fantastic of course, but even extremely minor characters such as the High Roller’s French waiter, gives a distinguished performance. The music, which has been reproduced by a live orchestra, supports the tone of the scenes well. Changes in the music are triggered with expert timing, often to great cinematic effect. It is unfortunate that Grim Fandango Remastered doesn’t add an autosave feature. I lost some progress to a few animation bugs I encountered; a character would be stuck in a loop and the game would effectively locked up, making saving and loading impossible, I played on the PC. More frustratingly, the new game option is perilously close to the save game option, pretty early on I accidentally hit new game and it immediately started rolling the opening scene, costing me perhaps thirty minutes of progress. A situation that is unlikely to be encountered by many, but I cannot overstate what I would have given for an, ‘Are you sure?’ prompt. There are a few options that can be enabled, such as; framed 4:3 aspect ratio, or 16:9 widescreen, see the old models and lighting or the new. There are varying control options and a concept art gallery. Developer commentary can also be enabled, and triggered in various environments and scenes throughout the game. In the commentary they discuss some of the development and design decisions, recount ideas that were never implemented, and more, which I found interesting to listen to. Time has done nothing to offset the comical charm of Grim Fandango. The characters, story, direction and voice acting remains intact and as excellent as you may remember. Grim Fandango Remastered provides a method of experiencing it all again on modern machines, with pleasing graphical and soundtrack upgrades, and interesting developer commentary. While not punishing, Grim Fandango’s more obscure puzzles can easily degenerate into the tedious, and often frustrating, act of trying every item on everything in sight. That said, Grim Fandango stood the test of time far better than I had imagined, and is still very much worth playing through, even if it means consulting a guide when the puzzles become too obscure.